Kevin Pietersen's test future may be in doubt but the mercurial batsman was hailed as a "million pound asset" when named in England's provisional 30-member squad for this year's Twenty20 World Cup in Bangladesh on Wednesday. A swashbuckling batsman who polarises opinion, Pietersen was a target for heavy criticism after England's 5-0 Ashes surrender in Australia despite being the highest run-scorer from his side. Earlier this month, coach Andy Flower felt compelled to issue a statement denying a dressing-room rift after British media claimed he had threatened to quit if the South Africa-born batsman continued to be part of the team's rebuilding process. Captain Alistair Cook has also ducked questions concerning Pietersen's test future but the 33-year-old's international career looks far from over after selectors opted to consider the use of his hard-hitting prowess in Bangladesh. "There was no discussion at all about leaving him out," England's limited-overs coach Ashley Giles told reporters in Brisbane ahead of the team's second one-day international against Australia on Friday. "He's another million pound asset at least, he might be worth a bit more than that." 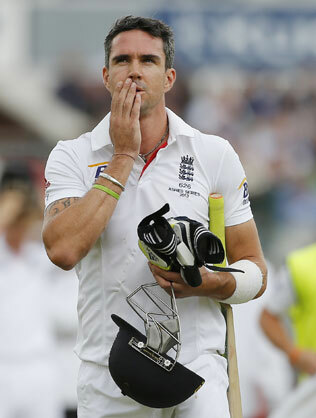 Pietersen has been rested from England's limited-overs series (five one-day internationals and three Twenty20s) in Australia. "He's a fantastic player and he's shown that in T20 cricket. He's not played that much for me in T20, but in other competitions how dangerous he can be," Giles said. The squad will be pruned to a final 15-member party following the three-match Twenty20 series against Australia beginning on Jan. 29. Led by Stuart Broad, 2010 champions England will begin their quest for a second title with a Mar. 22 match against New Zealand at Chittagong. Squad: Stuart Broad (captain), Moeen Ali, Jonathan Bairstow, Gary Ballance, Ravi Bopara, Scott Borthwick, Tim Bresnan, Danny Briggs, Jos Buttler, Michael Carberry, Jade Dernbach, Steven Finn, Harry Gurney, Alex Hales, Chris Jordan, Craig Kieswetter, Michael Lumb, Eoin Morgan, Graham Onions, Steven Parry, Samit Patel, Kevin Pietersen, Boyd Rankin, Joe Root, Ben Stokes, James Taylor, James Tredwell, James Vince, Chris Woakes, Luke Wright.